فیلمین سناریو یازاری, موسیقی‌چی و اوْیونچو. 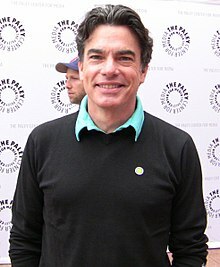 پیتر قلقر (اینگیلیسجه: Peter Gallagher) آمریکالی فیلمین سناریو یازاری, موسیقی‌چی و اوْیونچو. 1979–گۆنوموز ایللر آراسیندا سینما ساحه‌سینده چالیشیب. 1999 House on Haunted Hill Donald W. Blackburn, M.D. 1984 ABC Weekend Specials Phil Grey Episode: "A Different Twist"
Private Eye Tommy Baron Episode: "Blue Hotel Part 1"
1998 Homicide: Life on the Street Chris Rawls Episode: "Closet Cases"
Superman: The Animated Series Kurt Voice; Episode: "Where There's Smoke"
2001 Family Guy Jared Voice; Episode: "Lethal Weapons"
2008 Shark Frank Bell Episode: "Partners in Crime"
2012 How I Met Your Mother Professor Vinick Episode: "The Final Page"
2018 Murphy Brown John Haggerty Episode: "Results May Vary"
2019 The Conners Brian Foster Episode: "Rage Against the Machine"
اینگیلیسجه ویکی‌پدیاسی‌نین ایشلدنلری طرفیندن یارانمیش«Peter Gallagher»، مقاله‌سیندن گؤتورولوبدور. ( ۲۲ ژانویه ۲۰۱۸ تاریخینده یوْخلانیلیبدیر). قارداش پروژه‌لرده پیتر قلقر گؤره داها آرتیق بیلگی‌لر تاپابیلرسینیز.